Vanuatu’s ability to respond more effectively to disasters has been bolstered today with the handing over of three emergency boats, two vehicles and a flatbed truck. The timely gesture to support response and relief following disasters, like Cyclone Pam, has been made possible through the European Union’s EUR 19.37 million Building Safety and Resilience in the Pacific Project (BSRP), implemented by the Pacific Community (SPC). European Union Ambassador to Solomon Islands and Vanuatu, H.E. Leonidas Tezapsidis, presented the heavy haulage flatbed truck, boats and vehicles to Lieutenant Colonel Acting Commander, Terry Tulang, of the Vanuatu Mobile Force (VMF), the Director of the National Disaster Management Office (NDMO), Shadrack Welegtabit, and the Director-General of the Ministry of Climate Change, Jesse Benjamin, in the capital, Port Vila. These items will be used to conduct assessments, transport relief items, evacuate people during emergencies and provide troop transport for first responders following future disaster events. These critical items serve to strengthen the relationship and coordination between the country’s Fire Service, the VMF and the NDMO. They will be used to support emergency preparation and response, for example, to move personnel, transport relief, distribute critical supplies and improve access to outer islands. The flatbed truck will also be used to cart water during times of drought and El Niño, which has been occurring recently throughout the country. Ambassador Tezapsidis said: “Vanuatu is particularly vulnerable to natural disasters. It is imperative, therefore, that its emergency services be properly prepared to respond as swiftly as possible". “This is why the EU supports projects that benefit communities, either directly or in collaboration with government institutions, or development partners such as SPC,” he said. On 13 March 2015, Vanuatu was hit by the largest cyclone in its history, which caused devastation in many parts of the country. Mr Welegtabit said the country has learned from this disaster and continues to work towards building a more resilient Vanuatu for the future. “Coordination and working together in times of disaster is critical. These boats and trucks will give communities access to support services in a more coordinated way. We will be able to get staff and resources where they are needed faster,” the NDMO Director said. SPC’s Director for Melanesia, Mia Rimon, said providing Pacific governments with the means to address transportation challenges following disasters is a practical and critical form of support for island countries. “Ensuring communities can be reached before, during and after disasters like Cyclone Pam is critical. 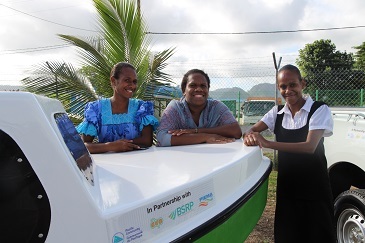 We’re really impressed with the Vanuatu Government’s commitment to improving disaster resilience and know that these trucks and boats will be a huge support in the future,” she said.